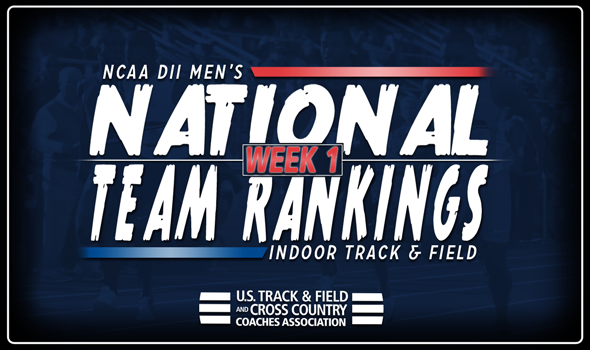 NEW ORLEANS –The NCAA Division II Preseason Men’s National Team Computer Rankings came out back in December, giving teams an opportunity to get a lot of work in before the first week of rankings were released. Colorado Mines did just that. The Orediggers shot up 16 spots from the preseason poll to overtake the lead in the newest batch of rankings released by the U.S. Track & Field and Cross Country Coaches Association (USTFCCCA) on Tuesday. The ranking marks the first time in program history that Colorado Mines has been in the top spot. Connor McLean helped Colorado Mines achieve that status by climbing to the top of the NCAA Division II Descending Order List with a pole vault mark of 5.12m (16-9½) this past weekend. Teammate Jake Pinkston’s vault of 5.02m (16-5½) at the same meet is fourth on the list. Tiffin and Ashland remained in second and third, respectively, in the rankings, while Grand Valley State jumped two spots to fourth. Adams State slipped four spots to fifth to round out the top-five. The bottom half of the top-10 all saw some movement, with Findlay gaining the most ground. The Oilers moved up eight spots to sixth thanks to the second-best shot put mark in NCAA Division II this season from Austin Combs (18.20m or 59-8½), as well as a triple jump mark of 15.16m (49-9) from Martin Etsey that sits sixth on the Descending Order List. Lincoln (Mo.) and Pittsburg State also moved up in the rankings to seventh and eighth, respectively, while Saint Augustine’s jumped into the top-10 at 10th after sitting in 13th during the preseason rankings. Missouri Southern fell from fifth to ninth. There was a slew of considerable movement outside of the top-10, as well. Six teams in the top-25 jumped 16 spots or more. U-Mary saw the biggest leap, as the Marauders moved up 64 spots to 15th. Luxon Glor (60 meters) and Josh Lamers (60 hurdles) posted outstanding marks in their respective events this past weekend to place third on the Descending Order Lists. Queens (N.C.) also climbed the ladder, moving up to 22nd from 51st thanks to its distance medley relay squad that notched the third-best time in NCAA Division II this season over the weekend. Colorado Christian (45th to 18th), Southern Connecticut (37th to 21st), Central Missouri (47th to 24th) and UC-Colorado Springs (52nd to 24th) also made huge jumps in the rankings on the week.